We now have two sons! 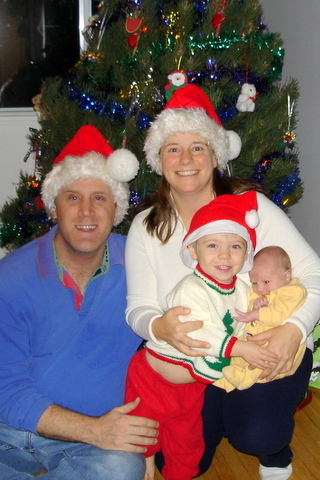 Ian Egan Immell was born on 15 December 2006.
staying in Vancouver. From 1998 to 2000, we called Nakameguro home. We thoroughly enjoyed Japan and had daily adventures. From 1995 to 1998, we called South Ken home. We took full advantage of being so close to Europe. From 1990 to 1995, we called Evanston and then Lincoln Park home. We still think of Chicago as "home". Have a look to see what Tara's been up to as she continually changes and adds to these pages. Travel is our #1 hobby and we've visited 41 countries to date. We always try to document our travels Taking time off from work to travel was a dream of ours that we made a reality from 2000 to 2003. We were married in 1994 on Maui, Hawaii. Getting married 'barefoot on the beach' was fun for everyone. We originally started this page for our friends and family in Chicago. We now have friends worldwide. Don't forget to have a look at our Photo Album! Seth still isn't sure if the camera he gave Tara for her 21st birthday is the best or the worst present he's ever given her. You decide after having a look at the thousands of photos on our web site. Thanks for stopping by! You are visitor # since we started counting on April 11, 1998 Please e-mail us at seth@immell.com or tara@immell.com. Since early 1994, we've loved spending time on the internet. Here are a few of our favorite pages.